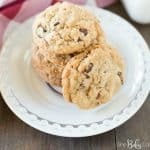 Nothing says love better than chocolate chip cookies, unless it’s these coconut chocolate chip cookies! And let’s be honest, who can resist anything with coconut?! 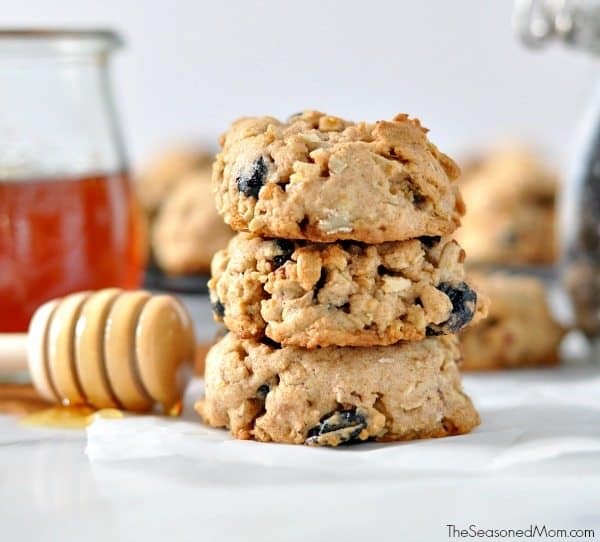 We certainly can’t and the combination of the coconut with the chocolate chips in the recipe is the perfect cookie recipe for cookies and milk. Hi there! It’s Kristine from She Bakes Cookies again! Every year when February rolls around, I feel inspired to make a new treat. And because I’m me, it’s usually a cookie of some sort. Last year, I made these sprinkle chocolate chip cookies and they have become a family favorite, but I get bored with all of the pink colored sweets, so I’ve been trying to branch out. This year I wandered way off the path and into the land of coconut with these thick and chewy coconut chocolate chip cookies and guess what? They were a HUGE hit! 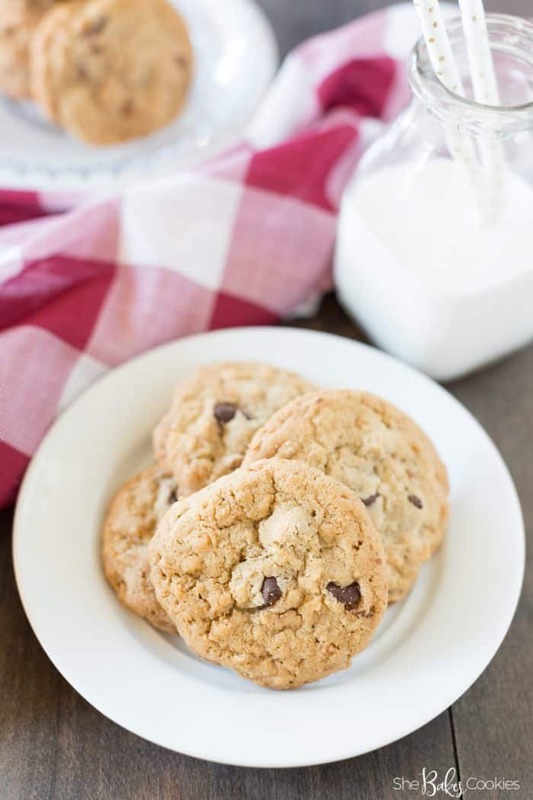 As with the majority of my cookie recipes, these coconut chocolate chip cookies are super simple to make and yes, you still only need one bowl, but…they do have one little tiny additional step – toasting the coconut! Don’t worry though, it’s also really easy to do and it just adds a few minutes to the total cook time. 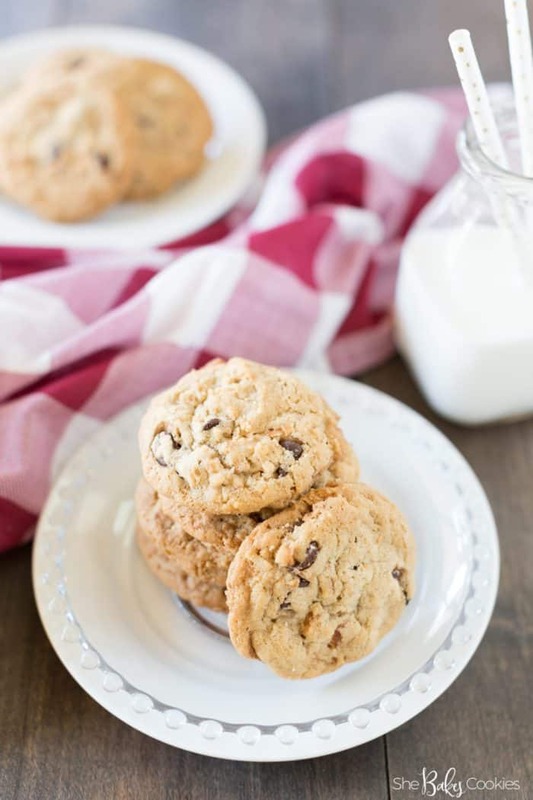 In fact, the coconut is probably my favorite part of this recipe; it adds an extra crunch and sweetness to these already-tasty chocolate chip cookies! Make sure to line the baking sheet with parchment paper or a silicone baking mat before spreading out the coconut. When you spread out the coconut, make sure it evenly spread and not too thick in any areas. Don’t let the edges get too brown. Make sure to stir the coconut during the toasting process to ensure even toasting. 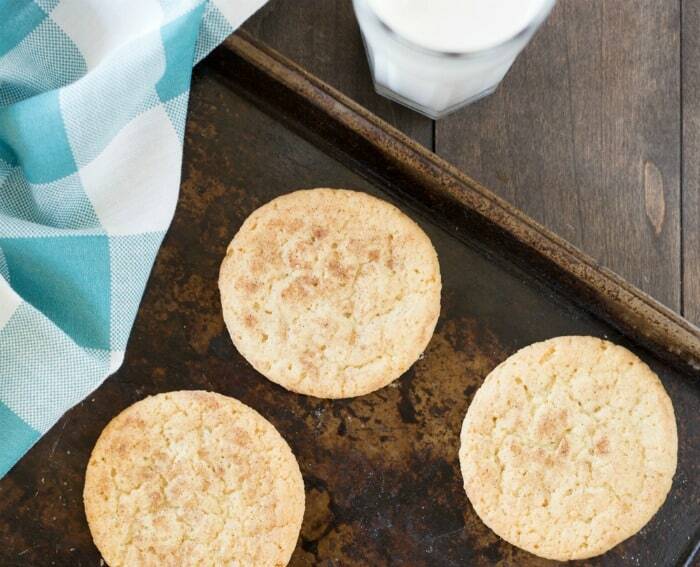 Let coconut cool completely before adding to the cookie dough. Once you get these coconut chocolate chip cookies into the oven, you’ll begin to smell the magic of the coconut! 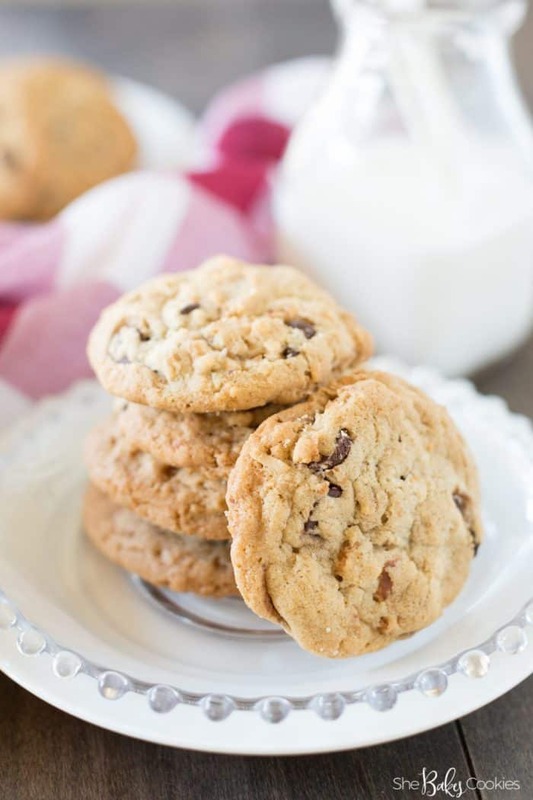 The cookies spread slightly, puff up just a tad, the chocolate chips begin to soften, and the coconut flakes melt into the dough forming the most perfect crispy, chewy, coconut chocolate chip cookie ever! I’m serious, you’ll LOVE these! I know not everyone is a coconut lover, so I’m also recommending my double chocolate cookies for the chocoholics or my flourless peanut butter cookies for the PB lovers; they’re two of my most popular recipes! 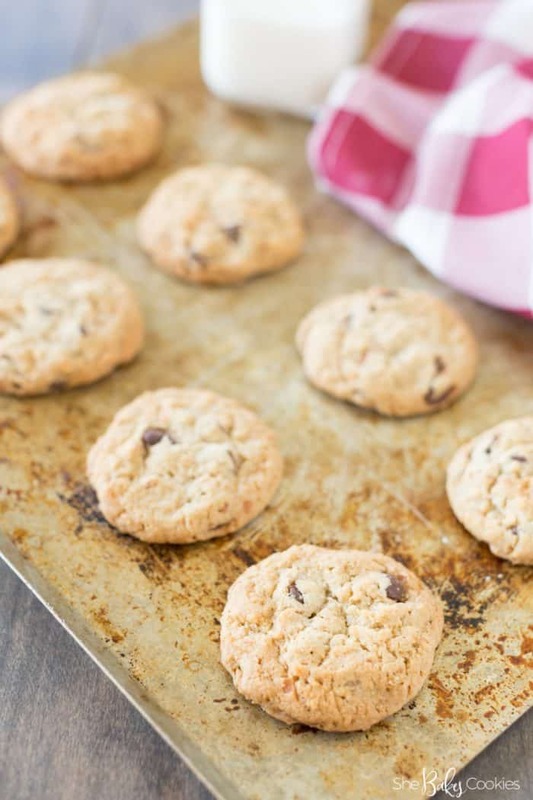 The toasted coconut on these coconut chocolate chip cookies make these cookies irresistible. The chewy goodness of these coconut chocolate chip cookies will have you coming back for more than one for sure. A think and chewy chocolate chip cookie loaded with toasted coconut flakes! Evenly spread the shredded coconut on a lined baking sheet and bake for 7-10 minutes until golden brown. Let cool completely. In a medium bowl, cream butter and sugars together until smooth. Stir in vanilla extract and egg and stir well. Add flour, half at a time and mix until fully incorporated. Fold in chocolate chips and toasted coconut. Using a 1 TBS cookie scoop, scoop dough onto lined baking sheets. Bake for 12-14 minutes, rotating halfway through, until golden brown on the edges. Let cool completely on the baking sheet and then store in an airtight container or freeze. Hi there! I’m Kristine the cookie lover, avid baker, and photo taker behind the blog, She Bakes Cookies. I love everything about cookies and believe life’s better with a cookie in each hand! Stop by and say hi sometime! 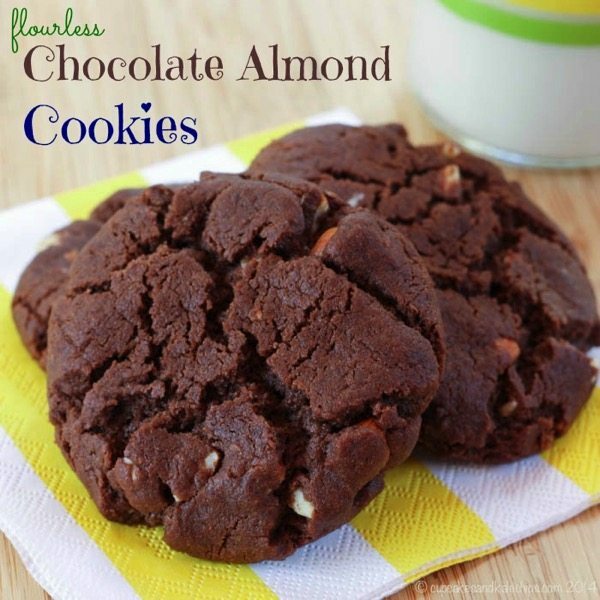 If you liked this Coconut Chocolate Chip Cookies recipe you might also like…. From left to right: Healthy Trail Mix Cookies, Flourless Chocolate Almond Cookies & Easy Snickerdoodle Recipe. These look delicious. I adore choc chip cookies but I’ve never made them with coconut so these are going to be perfect. I’ll have to wait for the weekend to make them. Can’t wait!